Beautify kitchen countertops Crafted Countertops installed on 8/26/11 in Edgerton, WI w/ 3/8″ radius top & bottom edge profile. We had to work with the Customer to design a very custom shape to the granite island countertop to incorporate the full round look on the overhang. This design had to be approved first before fabrication and it also allowed for maximum seating potential. The back splash had to be measured and fabricated to very specific dimensions. We also had to incorporate the back splash to be taller only under the window trim behind the sink so that it met the very bottom of the trim molding to achieve a tight fit. Custom master bath granite countertop installed on 8/26/11 in Edgerton, WI. The color is Volga Blue w/ 3/8″ radius top and bottom edge profile. The back splash height is 4″ tall. We had to set the counter cabinet down on the countertop after it was installed so that we could accurately measure, cut, & install the back splash on either side of the drop down cabinet. There are 2 undermount sink preps using our supplied Kohler porcelain undermount sinks model #K2210-96 in bisque color, also called biscuit color. 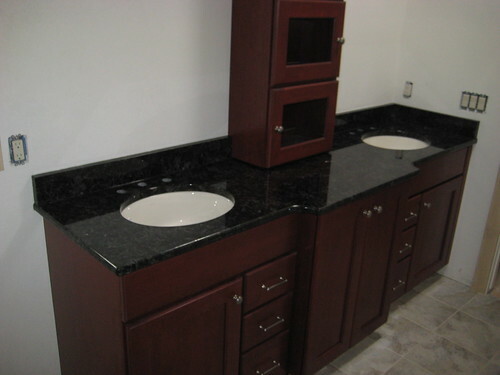 This top also features a beautiful 3″ bump out in middle which provides more surface area with the drop down cabinet. 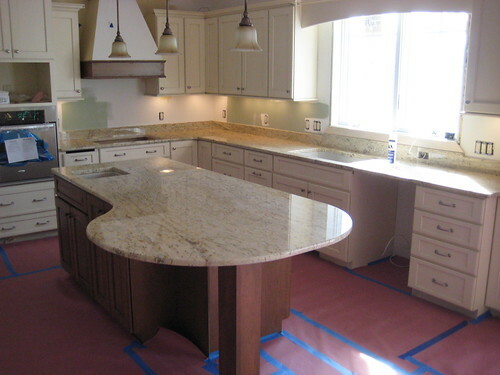 Countertop installation was complete after we applied our 15 year stain resistant stone sealer.